When I’m looking at a truck, there are certain key things that I always go to and check out before anything else. If the pickup falls short in these areas, then there’s no need to look at anything else; I already know that it’s a hard pass and time to keep looking. Those categories are the reason I’m so impressed by the 2019 GMC Sierra 2500HD because as I looked at it, all the boxes were getting ticked off one by one. I’m sure you have similar categories that you have in mind, even if you don’t really think about them, with boxes you mentally check off when it comes to a new truck. 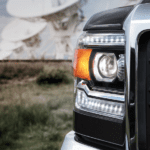 Whether they are things like towing capacity and box payload, or the engine options and maximum torque, or the choice of cabin, I think we all look for certain things that need to be there for a truck to make our list. While this might not line up perfectly with the areas that are most important to you, I’m sure we have a few overlapping requirements. And so I present my checklist, or at least part of it, and seven reasons you should give the 2019 GMC Sierra 2500HD a good look. I’m going to go out on a limb and guess that if you’re looking at a heavy-duty truck, then you probably care about the maximum towing capacity. I mean, if you’re not interested in the power to haul some serious cargo, then there’s no reason to pay the higher price for a heavy-duty model. And so, just like me, you probably look at towing capacity right away – if it can’t pull the loads you need to haul, then why waste time looking at anything else? The 2019 GMC Sierra 2500HD has a maximum conventional trailering capacity of 14,500 lbs. That’s more than I need on a daily basis, though admittedly I’m not a carpenter or plumber, and even with a camper loaded up for the weekend, that should be more than enough muscle. I also like that you can use a fifth-wheel or gooseneck and get that up to 15,400 lbs. – though, honestly, I doubt I would ever need that extra potential. But I’m still glad it’s there if I need it. Hauling a trailer or camper behind me is one thing – and sure that towing capacity comes in handy when a neighbor has a bunch of firewood to get rid of or a cousin needs help moving – but payload is what I tend to need more often. From one day to another, it’s more likely that I’m going to toss stuff into the box than take the time to hitch up a trailer and haul a load across town. That’s why I like to see the maximum payload of 3,276 lbs. on the 2019 GMC Sierra 2500HD. Sure you can step up to the 3500HD and get an incredible 6,112 lbs. but personally, that’s just not a weight rating I’m ever going to get up to. If you know you need that extra payload, then, by all means, check out the 3500HD, but for me, the 2500HD checks off this box quite nicely. I like options. It doesn’t matter if I’m looking at a truck, checking out a laptop, or just going to a burger joint – I like to have choices and figure out what’s just right for me. So I tend to look for trucks that have a couple different engines to choose from – this makes it easier for me to find what’s right for my needs, and recommend the truck to someone else. The 2019 GMC Sierra 2500HD has two different engines available, which already makes me happy, and they are both quite impressive. The standard engine is a Vortec 6.0L V8 engine that provides 360hp and 380 lb.-ft. of torque, which is what you would expect in a heavy-duty pickup. That’s probably enough for me, but if you need more power, then there’s an available Duramax 6.6L Turbo-Diesel V8 engine that offers 445hp and an incredible 910 lb.-ft. of torque. If you need to haul a trailer full of lumber uphill, then this will get the job done. I know as a polite society, we’re not really supposed to talk about money and discuss finances, but I don’t care. Starting price when it comes to a vehicle matters. Of course, there are going to be options that turn that price up substantially – but a reasonable starting price makes for a more reasonable higher price once I load it up with the options I want. The starting price of the 2019 GMC Sierra 2500HD is a very reasonable $38,100. Sure, that’s a lot compared to a mid-size sedan or perhaps even a compact SUV, but think about what you get here. This is a heavy-duty full-size pickup that can handle thousands of pounds of towing or payload in its box – that’s as good a starting price as you’re going to find. As I said before, I like options – and that extends to the overall design of the truck too. I like to see that I can choose between different cab and box lengths – even if it precludes me from some other options like engine or drive type. I just like knowing there are choices I can make to get exactly what I want. That’s why I’m thrilled that the 2019 GMC Sierra 2500HD includes both a crew cab and a double cab, and a standard box and long box, which you can arrange in any way you want. Too often there are trucks that have four or five different options, but you can only configure them in two or three ways. To me, more choices are always better. I could spend all day going on about the options for the interior features of the 2019 GMC Sierra 2500HD, but needless to say, they are plentiful. Many of these are standard features, but a lot of them are available options or only standard at higher trim levels. But ultimately that just means more choices and more options to really customize this beauty the way you want. There’s an Infotainment system with either a 7-inch or 8-inch touchscreen, and available Navigation, with support for Bluetooth connectivity, Apple CarPlay, and Android Auto. I’m not about to get into the platform battle regarding smartphones, but this truck has both covered. The standard sound system can be upgraded to a premium Bose audio system, there’s an available wireless charging pad, and leather-appointed seats are available and standard at higher trim levels. Just because I put this last, doesn’t mean it’s the least important – if anything, this is actually the single most important category for me. None of those other things matter if the safety features are lacking. No amount of towing capacity or powerful engines can make up for a ride that can’t keep me and my loved ones safe. Fortunately, the 2019 GMC Sierra 2500HD ticks this box off big time, especially with the available safety features you find at higher trim levels. These include things like front and rear park assist, forward collision alert, and lane departure warning. Plus there’s a Teen Driver system with an in-vehicle report card, which is perfect for my friends and family with kids who are going to start driving soon – so they can learn safe habits before they get that first great taste of freedom. What do you think of the 2019 GMC Sierra 2500HD? Does it tick all your shopping list boxes? Next post: Are We Looking Too Far Forward?